Mangaluru, May 02, 2018: "The innumerous people including women from the district who eke out a living by rolling beedies are today facing myriad of problems as owners are refusing to increase their wages. However, the Congress and BJP candidates who have failed to understand their problems are only boasting of working for the welfare of the poor. 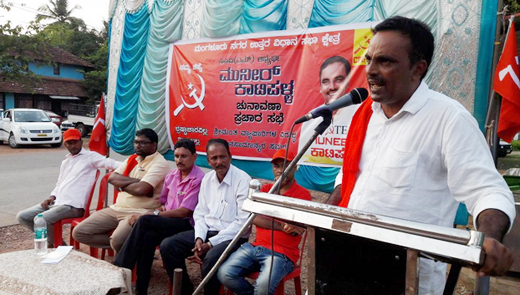 How can those who are unaware about the wages earned by beedi workers, strive for the welfare of poor?’’ questioned Muneer Katipalla, the CPI(M) candidate from Mangaluru North. He was addressing an election campaign meet at Kulai Junction on May 1, Tuesday. Continuing, he said the election was a fight between the working class and the rich. Both the Congress and the BJP are striving to win the polls by hiding real problems, he alleged. The politically conscious voters must cast their vote for the right candidates, he said. Corporator Dayananda Shetty, JD(S) leader Anand Bangera and others were present.